Dental Techniques can help to remove the spaces between teeth and the gaps in your mouth to give you a better and more appealing smile. There are many choices including dental implants that can also be used in combination with restorative dentistry to give you the complete smile. 1. Gaps between teeth because of a missing tooth. Dentures - this option is useful when a transitional option is required after the loss of a tooth. The definitive options include an acrylic denture or a cobalt chromium denture. Denture forms a cost effective option when there are multiple missing teeth or when there is inadequate bone for implants or if the teeth quality to support bridges is poor. Bridges- this is useful when a fixed option of tooth replacement is required, and the supporting teeth have existing restorations are present and when Implant treatment is either not possible or not preferred. Composite using fibre reinforcement to support the missing tooth such as Stich- Tech . Definitive bridges are often made from porcelain for front teeth or from porcelain bonded to metal for back teeth and are bonded to either a single tooth or two neighbouring teeth. Implants- when there is adequate bone, the neighbouring teeth have no dental work and there is adequate bone than implants are treatment option of choice. 2. Gaps between teeth when no teeth are missing tooth. Thus arises because of a dental alveolar discrepancy. There are a variety of methods of closing these gaps. Veneers- composite or porcelain veneers can close gaps dependant on the patient preference of material once understanding the advantages and disadvantages of the methodology. This also is an option to be considered when the patient has other issues such as discoloured teeth, short teeth or existing restorations such as filings and crowns. Orthodontics- this includes options which can be carried out in a shorter period of time when using methods such as 6 month smiles, Invisalign or C fast. 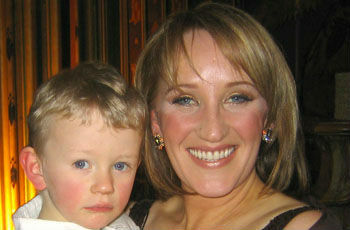 Conventional orthodontics is also an option which is highly recommended in patients who have bite issues. Sometimes a combination of approaches is required. Our porcelain veneers allow us to create veneers with no ( or sometimes minimal) drilling, no injection and suitable for nervous patients. 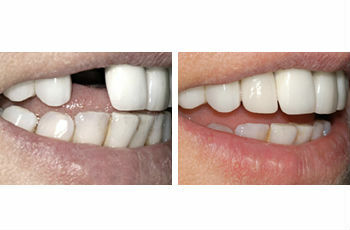 The veneers are made with latest compressed technology creating very thin, durable and aesthetic smiles. Dental implants replace tooth roots and are an attractive long-term solution for people with missing teeth. Our technology and state-of-the-art advanced systems ensure that we create beautiful natural looking teeth. The final result is where nobody can tell where your missing tooth once was. A Smile Makeover is redesigning a new enhanced and improved smile. Our technology and state-of-the-art advanced systems ensure that we create beautiful natural looking teeth. We are proud to provide the ultimate indentures. Because we understand what really makes a great smile, we can create really natural and pleasing looking dentures. 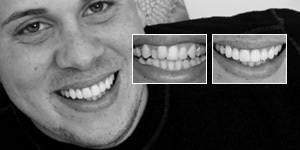 We use the best materials and skilled technicians who have an "artistic eye" in making false teeth look real. 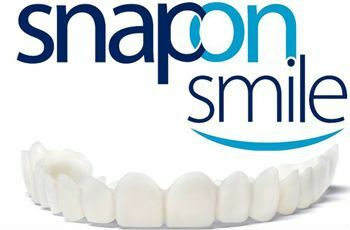 Snap-on Smile’s unique, proprietary formula of hi-tech dental resin make it very thin yet extremely strong. It fits right over your own teeth to give you a beautiful, natural-looking smile—even if you have stains, chips, gaps or missing teeth. Clear, hidden, or removable Our specialist orthodontists offer the best teeth straightening treatments available for the fastest possible results. We can create a natural, beautiful and straighter smile for you in a matter of weeks using clear braces like Invisalign. Visit our practices in London, Hertfordshire or Essex.